Furniture can kill or maim. According to anchorit.gov, every 15 minutes, someone is injured by furniture tip over in the U.S. The increase in furniture tip-over injuries over a period of time has made this a leading child safety issue. There have been a number of studies that delved into these injuries and their causes. A study at Nationwide Children’s Hospital in Columbus, Ohio which took into account data from 1990 to 2007 found a 41 percent increase in such incidents. Later studies have found that the numbers have not gone down. A U.S. Consumer Product Safety Commission (CPSC) data report (PDF) issued in 2012 showed that 2011 had the highest number of fatalities reported in a year. There were 41 fatalities recorded, which was an increase from 31 in 2010 and 27 in 2009. Besides these deaths, CPSC says about 43,000 consumers including adults and children are injured every year. About 59% of these injuries are to children under 18 years of age, and most of these injuries are to the head. As flat screen televisions are introduced into the household, older and often heavier televisions are moved into bedrooms or other areas of the home. Very often they are placed upon inappropriate furniture which was not meant to hold them. Unsurprisingly, the largest number of fatalities and accidents happened in bedrooms, followed by living rooms and family rooms. Heavy objects, mostly TVs, are placed on tables, cabinets, chests or other furniture that is not strong enough to support them. While TVs were involved in accidents with younger children, older children aged 10-17 were injured by desks, cabinets, and bookshelves tipping over. However, according to the study, most of these injuries involved children younger than 7 years of age and resulted from televisions tipping over. Over one-quarter of the injuries occurred when children pulled over or climbed on furniture. Follow manufacturer guidelines for how much weight a unit can safely hold. Place TV sets on entertainment furniture specifically designed to hold them. Do not use unstable tables, cabinets or chests. Even flat screen TVs can topple over if they are not placed on a piece of furniture that is designed to hold them. Once placed on appropriate stands, push the TV as far back on the furniture as possible. Strap TV sets to a stable stand or wall. Attach large furniture, such as dressers or bookshelves to the wall with safety straps, L-brackets or other strong attachment devices. This will create a safer home even when small children are not present. Do not store objects attractive to children, such as toys or remote controls, on top of a TV set, bookshelf or any other high furniture surface. A child might try to climb to the top to get them. Prevent children from pulling drawers more than two-thirds of the way out by installing stops. Pulled-out drawers can shift the weight of a large dresser and cause it to fall over. 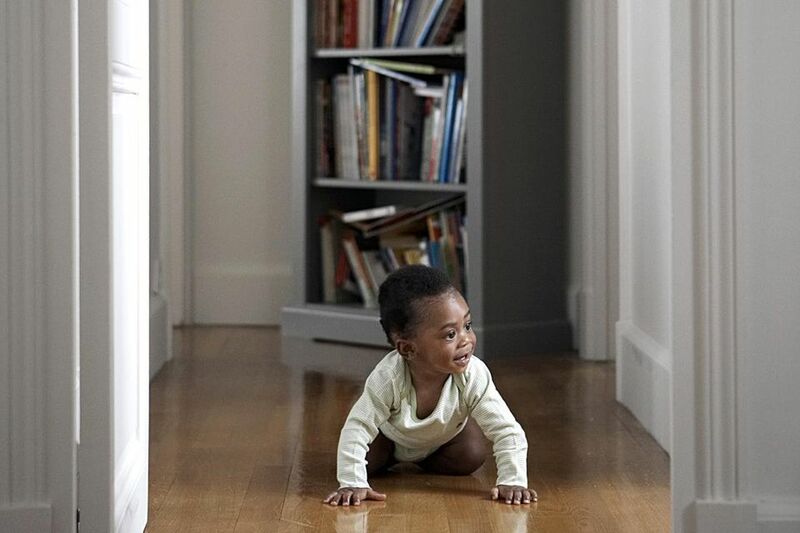 Children should be instructed to never climb into, stand inside or hang on drawers, doors or shelves. When buying furniture look for cabinets or chests that are well made. Drawers should open and close smoothly without sticking. Yanking on a stuck drawer can also cause chests, dressers or cabinets to topple over. Do not overload bookshelves and bookcases. Strap tall bookcases to the wall to prevent tip-over accidents. Always supervise young children in a room where these safety tips have not been followed. This can often be when they are visiting a friend's or relative's home.